“Yannix Goes Back to School” (Give It 2 Get It #9) – Yannix(Thailand)Co.,Ltd. 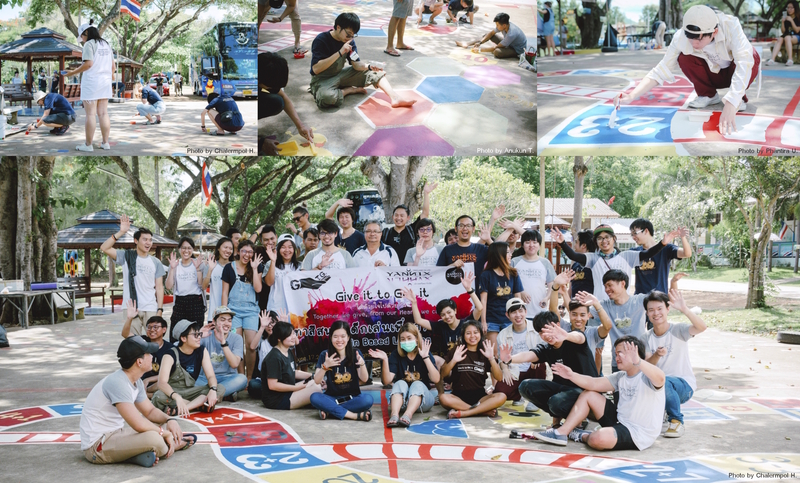 The Yannix Rotomation Team and Yannix staff volunteered their Saturday to help renovate the playground at the Baan Nong Hong School. This particular playground is used for Brain Based Learning (BBL) programs. BBL educators employ teaching methods and construct lesson plans based on the science of learning, often eschewing more traditional teaching methods based on assumptions from the past. Our host for the day, principal Prateung Klinlek explained to the Yannix Team that Baan Nong Hong School was established in 1964 by the local community. Back then, the school consisted of three small classrooms without walls. The team learned that in 2006, the school was in disrepair and was in extremely poor condition. So the Kaeng Krachan Country Club Golf Course & Resort and the TrueBuddhaSchool Thailand Foundation stepped in and pulled together resources (around US $46,000) and together they built four brand new classrooms and a teacher resource room. The resulting annex is both aesthetically beautiful and structurally stable and durable. The tiny, once dilapidated school is now the pride of the community. Baan Nong Hong School currently has an enrollment of 41 kindergarten students and 83 elementary students. Yannix thanks our host, principal Prateung Klinlek, everyone at Baan Nong Hong School and members of the surrounding community for making it a special day.